This is a scarce 1852 map or chart by Joseph Meyer depicting plant geography. It shows the distribution of vegetation throughout the world. 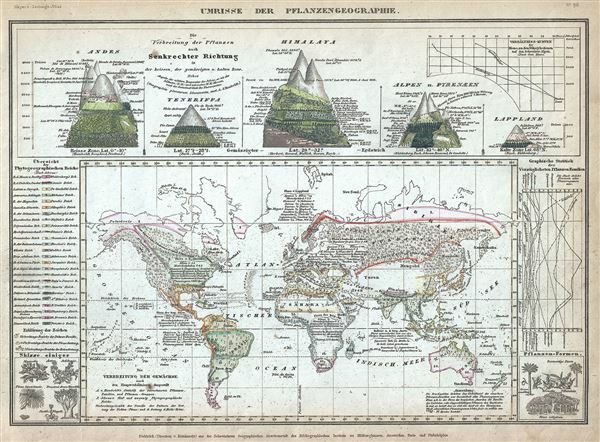 Above the map proper, Meyer includes five illustrations showing the vegetation in various regions, including the Himalayas, the Andes, the Alps, etc. A key and other statistical data is included along the sides of the map. The bottom left and right quadrants include illustrations of various plants. This map was issued as plate no. 96 in Meyer's Zeitung Atlas. Although all the maps in this atlas are not individually dated, the title page and maps were often updated while the imprint with the date was not, causing confusion to the exact date for some of the maps. Moreover some maps in the atlas were taped in at a later date as an update to the atlas. We have dated the maps in this collection to the best of our ability.